The Institute offers a collection of Juvéderm fillers in their Doylestown, PA treatment center of Bucks County. These include Juvéderm Ultra, Juvéderm Ultra Plus, Juvéderm XC, Juvéderm Voluma XC, Juvéderm Vollure XC, and Juvéderm Volbella XC. Dr. Glenn DeBias is ranked in the top 1% of cosmetic injectors in the country based on experience and status. The Institute has performed over 25,000 dermal filler and injectable treatments to date. 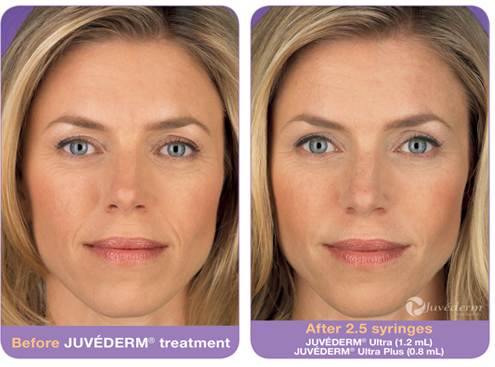 With Juvéderm, the injection process takes only about 15 minutes and results are immediate. Plus, there’s minimal recovery or downtime. So you can step into our office for treatment and step right back into your life. Juvéderm Ultra is a smooth consistency gel made of hyaluronic acid—a naturally occurring substance in your skin that helps to add volume and hydration. Your healthcare professional eases Juvéderm Ultra injectable gel under the skin to instantly restore your skin’s volume and smooth away facial wrinkles and folds, like your “smile lines” or “parentheses” (nasolabial folds—the creases that run from the bottom of your nose to the corners of your mouth). Juvéderm Ultra provides a smooth, natural look and feel—so everyone will notice (but no one will know)! In fact, studies show superior results of Juvéderm compared to a collagen-based dermal filler. Almost 90% of all study volunteers who were treated with both Juvéderm injectable gel and another dermal filler† preferred Juvéderm™! Juvéderm injectable gel is the first FDA-approved hyaluronic acid dermal filler that is proven to be safe and effective for persons of color. Juvéderm Voluma adds volume to correct age-related volume loss in the cheeks to help create a more youthful appearance. Juvéderm XC instantly smooths moderate to severe parenthesis lines and wrinkles around your nose and mouth. Juvéderm Vollure softens moderate to severe facial lines and wrinkles to create a smoother appearance. Dr. DeBias is a Diamond status provider for BOTOX® Cosmetic and Juvéderm™. For limited time offers, please visit our specials page! Click here for more information on Juvederm and questions you should ask when seeking a qualified specialist.